Monsters Inc. was an unexpected surprise, and I would say Monsters University is just the same. 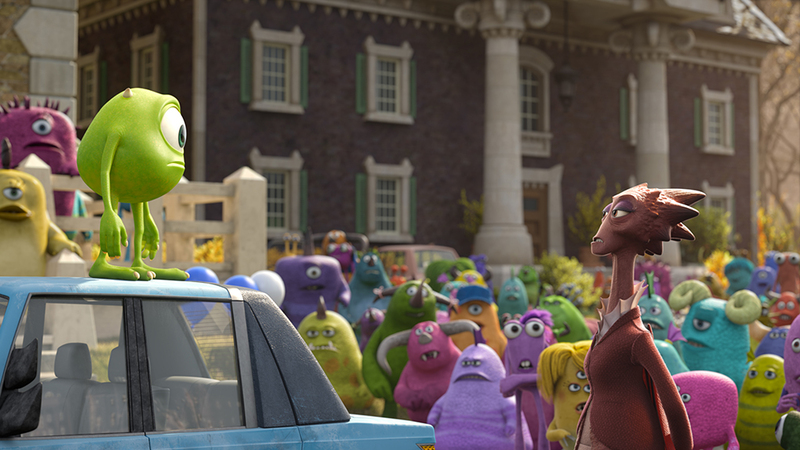 Monsters University– University where monsters go to get education. Scare Program– A program in the university that teaches monsters how to scare. Scarer– A monster that scares for a living. Monsters University is a movie for kids from 7 and up, The movie is definitely not a one for a 2 year old, the squirming in the seats after 1 hour into a 1 hour 42 minutes movie and the crying from the roars of the monsters did not help in a crowded theater. Pixar creates the stereotypical high school/college types from sorority girls known as PNK (which reminded me of Victoria Secret’s PINK—with the same font and everything) to a fraternity group known as Roar Omega Roar filled with “elite” scaring members. Did you notice Randall on the left? The movie explains how Randall became who he is in Monsters, Inc.
Mike and Sulley get kicked out of the Scare Program because they end up breaking Dean Hardscrabble’s lifetime of scare in a can during a final in the Scare Program, but she points out their weaknesses—Mike is not scary enough and Sulley is too impulsive. If you haven’t guessed, Mike and Sulley are the nerd and jock, respectively, becoming an unlikely pair of friends. They end up joining a fraternity called Oozma Kappa to participate in the “Scare Games” because Mike makes a wager with the Dean that if his team wins they will be able to go back into the Scare Program, but if they lose Mike will leave Monsters University. Oozma Kappa are all members that want to be Scarers but do not have the attributes of a stereotypical Scarer and help make the movie hilarious. Mike is the brains of the team, and teaches Oozma Kappa the various techniques of scaring and what scare tactic to use on specific fears. In the end, Mike and Sulley are expelled, and Pixar creates a fast timeline of the events of how they get into working at Monsters, Inc as Scarers. The two stick together from expulsion to work in the mailroom, then as janitors, then cafeteria workers, afterwards becoming can wranglers (where they keep the screams in the can), and finally working as a Scarer. In each position they held, they worked their hardest and received recognition for what they did. Mike and Sulley becoming friends. The plot of the movie is pretty much about the underdogs rising up to the challenge in an event called the “Scare Games”, and accepting who you are and what you have to offer. A learning lesson that I got from the movie: There are different routes to where you want to get to, whether through education or by working your way up, either way they both take you to your destination. Don’t forget to watch “The Blue Umbrella” short at the beginning of the movie, it’s very cute and I would’ve never guessed I would have emotions for an umbrella lol. This entry was posted in Entertainment, General and tagged dean, disney, hardscrabble, mike, monster, monsters inc., oozma kappa, pixar, PNK, roar omega roar, sulley, university by JNYFAV. Bookmark the permalink. Great review! I just saw it yesterday and I loved it! I would definitely see it again!! I know right! I could see it again too.